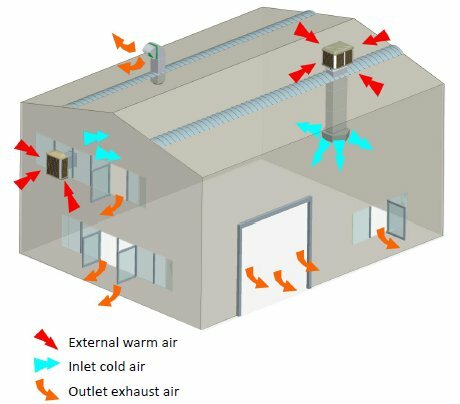 Industrial Air Cooler vs Industrial Air Conditioner Which to choose? Industrial Air Cooler vs Industrial Air Conditioner Which to choose? Evaporative cooling is up to 80% cheaper to install than air conditioning, uses only about 15% of the energy, and delivers a more comfortable environment. PremiAir are the leading independent installer of evaporative cooling in the UK. We will offer you advice, support and installation services that are second to none, so why not give us a call on 0345 257 9100 now to arrange a free survey, or just to have a chat? In a direct comparison of air cooler vs air conditioner, evaporative cooling achieves an 80 to 85% saving in energy costs compared to traditional air conditioning. Of course this means lower running costs and a smaller carbon footprint, but just as importantly makes it possible to cool areas that previously would have been thought impossible. Comfort isn’t just a function of temperature; oxygen levels make a huge difference too. Because evaporative cooling delivers 100% fresh air instead of recirculating, oxygen levels are high, promoting alertness, which leads to higher productivity, better and safer concentration levels, and a feeling of wellbeing. When it’s properly applied, evaporating cooling is significantly cheaper to install than traditional air conditioning, not least because there’s rarely any need to upgrade your power supplies. At PremiAir we’ll give you as realistic comparison, so that you can see the benefits for yourself. Still have queries over air cooler vs air conditioner? Give us a call today. At PremiAir, we’re determined to breath a breath of fresh air into your experience of contractors, and change your perception of how they work for the better. Read on below to learn how we do that. Premiair offer heating, cooling and ventilation systems benefitting from guaranteed prices, high quality workmanship, and minimal disruption.